COMPANY PROFILE Prudential PLC is a financial services group that offers life insurance, long-term savings and protection products, retirement income solutions and asset management services throughout Asia, United States and United Kingdom. Prudential PLC business is Jackson Life in the U.S. This is solely an annuities business and has become the leading variable annuity seller in the U.S. market. Asia is Prudential’s growth driver and offers health and protection on a unit-linked chassis, serving largely Southeast Asian markets. Prudential UK is the smallest business and offers the lowest operating returns on equity. Having stopped entering the U.K. bulk annuities market, and no longer selling individual annuities, the division is now an investment and pensions offering. 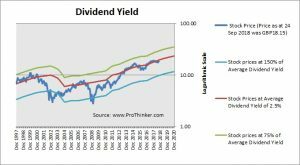 We should not only be concerned about the amount of dividends, we should determine if the dividends paid out by the company are sustainable. One way to do that is to compare dividends paid out to the cash flows that the company is generating.